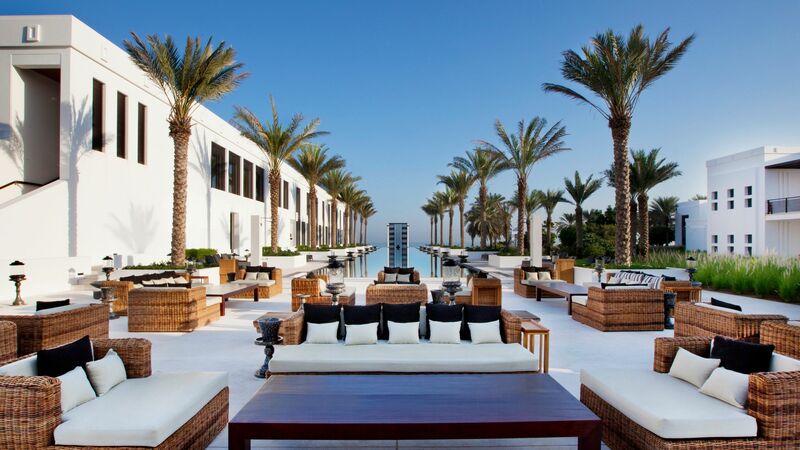 The Chedi Muscat is a stunning property located on 21 acres of landscaped gardens, overlooking the sparkling waters of the Gulf of Oman. 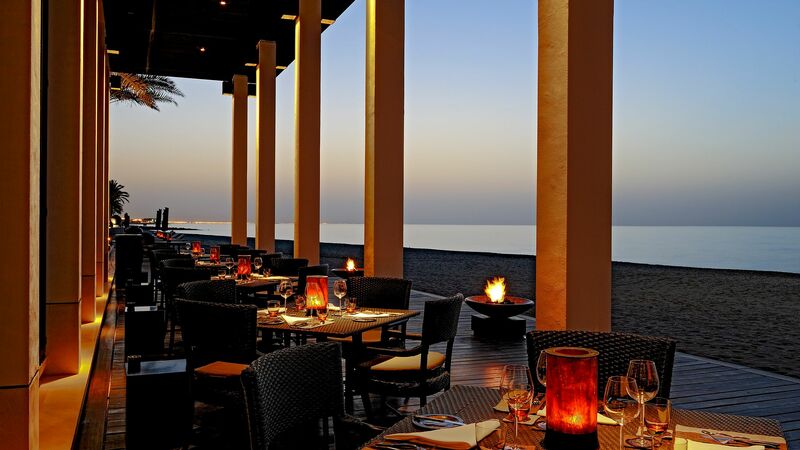 The hotel is set between the Al Hajar mountains and the Gulf of Oman, close to the heart of Muscat; a unique city full of history and inviting restaurants. The hotel’s outstanding rooms are full of luxury amenities, with garden and sea views and traditional Omani architecture throughout. There are plenty of activities to choose from, including dolphin tours and desert safaris. 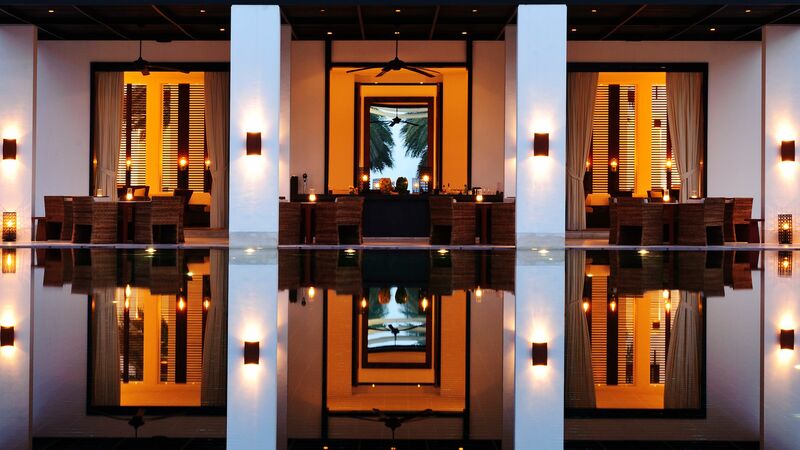 On your return, enjoy the hotel’s nine exquisite dining venues or take a dip in one of the three swimming pools. 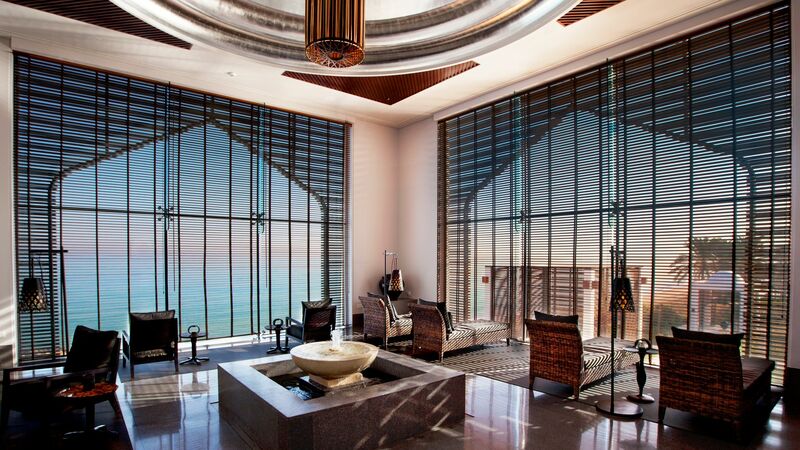 Alternatively, reawaken your senses with luxury treatments at the spa, which is the largest in Muscat. Hotel child prices apply to ages 0–6 years. The hotel has 158 rooms and villas. 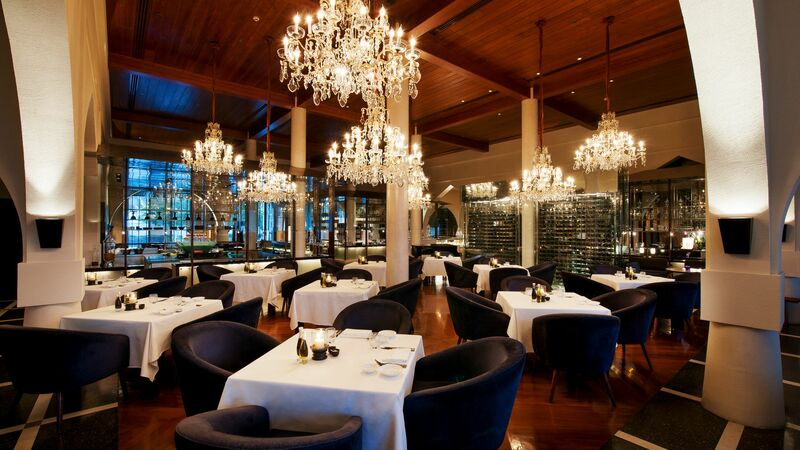 An open show kitchen set beneath stunning arches and crystal chandeliers, and serving international cuisine for breakfast, lunch and dinner. Guests can also enjoy the champagne brunch on Fridays. Open: 07:00 - 10:30, 12:00 - 15:00 and 19:00 - 22:30. Dine in the high-ceilinged dining room or on the waterfront patio. 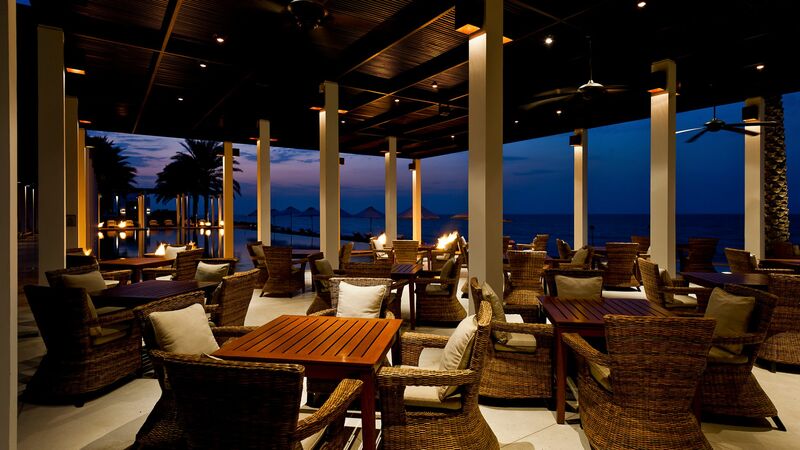 The restaurant serves a colourful à la carte seafood menu inspired by Europe and the Far East. There’s also an excellent wine menu. Open: 19:00 - 22:30 Saturday to Wednesday and 19:00 - 23:00 Thursday to Friday. A colourful experience with local Omani music and beautiful lighting. 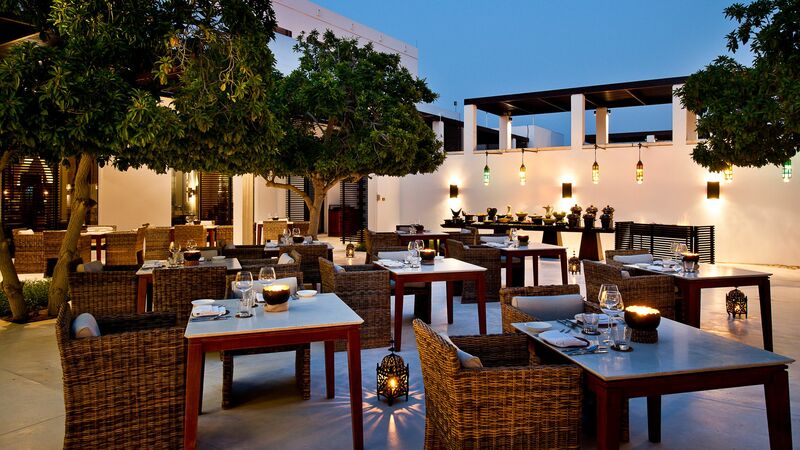 This creates the perfect romantic atmosphere and offers traditional Omani food, including Arabic mezze and kebabs. Open all day and serving light snacks, including authentic Asian dishes. Contemporary music and great views make this a relaxing setting to soak up the sun. Open: 10:00 - 23:00 and 12:00 - 23:00. A selection of healthy Mediterranean meals is served in this open air dining room, which can be found right next to the sparkling waters of the swimming pool. Open: 09:00 - 18:00 and 12:00 - 17:00. An incredible poolside restaurant serving a fusion of authentic Japanese and Malaysian food, including beautifully crafted sushi and spicy Malay fare. Three outdoor temperature controlled swimming pools include The infinity Chedi Pool and The Serai Pool which overlooks the lush gardens. The Long Pool is the longest in the region. Overlooking the Arab Peninsula, the golden sandy beach is ideal for those wanting to simply spend long, lazy days soaking up the sun. 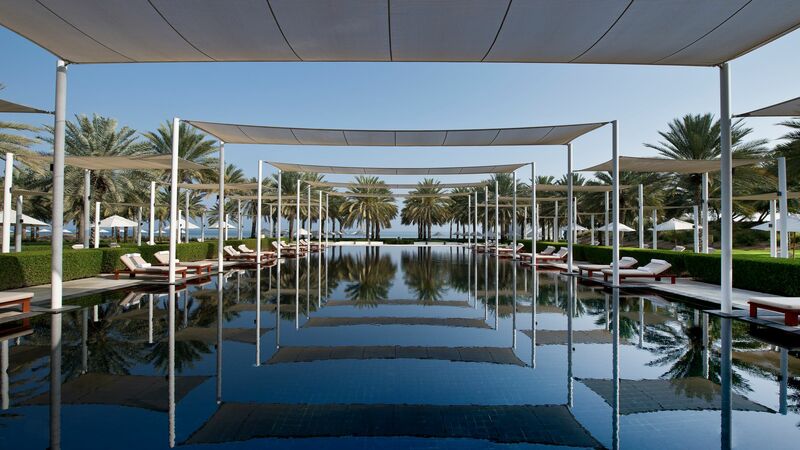 A sophisticated oasis by the sea and the largest luxury spa in Muscat. Experience revitalisation, with extensive beauty rituals led by expert spa therapists in 13 beautifully appointed suites. Enjoy a variety of fitness classes including Pilates, yoga and aquatics. Expert personal trainers are on hand too, with individual training programmes personalised to your needs. There are also meditation and stretching classes. 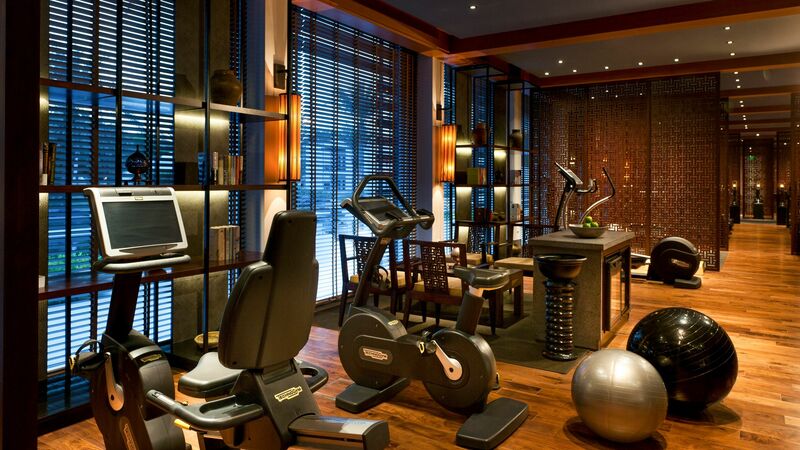 The Chedi Muscat has a state of the art fitness studio with the latest equipment, which is located in the Health Club. Muscat is a historic city, found between the mountains and the sea along the Arab Peninsula. It enjoys a spectacular climate, with year round sun and plenty of beaches for those wanting to simply relax. The sprawling port is home to fishing boats and luxury yachts, as well as offering excursions for dolphin spotting, scuba diving and snorkelling. In Old Muscat, you’ll find traditional villas and luxury hotels, as well as opulent palaces and towering mosques. Try delicate local dishes, including delicious Arab mezzes and freshly caught seafood or wander through the streets, picking up bargains on designer items and in trinket shops. 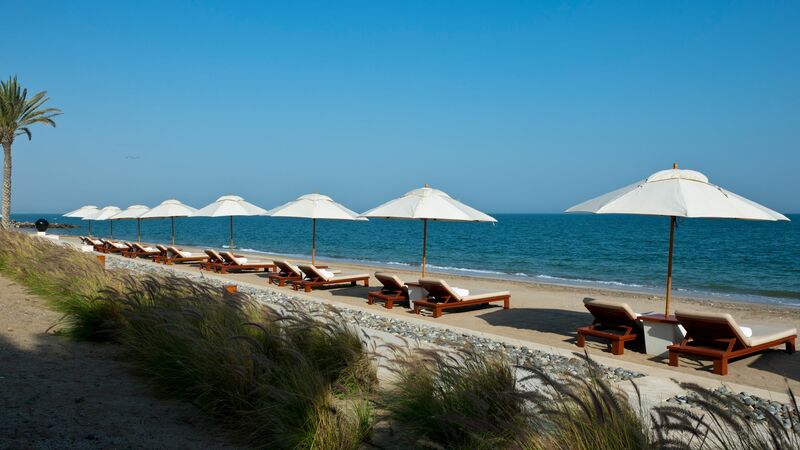 The Chedi Muscat hotel is 25 minutes from Muscat Airport. Serai Rooms feature high ceilings and oversized windows as well as a queen size bed and an open-plan bathroom with rain shower and luxury amenities. Guests can also enjoy a complimentary minibar replenished daily as well as a daily fruit basket. Chedi Deluxe Rooms feature high ceilings and oversized windows as well as a king size bed and an open-plan bathroom with rain shower and luxury amenities. Guests can also enjoy a complimentary minibar replenished daily as well as a daily fruit basket. I just want to say I?? ?m beyond impressed with the management. I had some initial concerns about the room and the management handled it beautifully. The room I got was a palace - superb compared to any other luxury property I?? ?ve stayed at. The class with which the staff handled the situation was unparalleled. I?? ?m very happy. Best anniversary weekend ever. I feel like a queen. And the Chedi staff are the best I?? ?ve seen. “ NOTHING SHORT OF PERFECTION.